A floating platform on the Thames in central London needs "further thought" before it is built, a government advisory body has said. 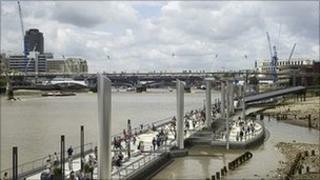 The London River Park will run for 1km (0.6 miles) from the Millennium Bridge to the Custom House Access Bridge. A public consultation was launched and City Hall has pledged £60m in funding. But the design and its impact on the river and local sites must be revised, the Commission for Architecture and the Built Environment (Cabe) has said. The platform will be 10m (33ft) wide, and in May, Mayor Boris Johnson said its "sheer beauty and design brilliance" would provide "yet another amazing and unique attraction" for London. In its formal response to the planning application, Cabe said it supported the concept of a temporary park on the river, as this could become "a significant asset" to London in 2012. But rather than being a park, it said the structure appeared "more akin to a pier or walkway" and called for a more impressive landmark to show off London. The design, with concrete seats and large trees in containers, may not be "appropriate to the character of the river", Cabe added. It also doubted whether there would truly be "free access" to the park, given areas would be cordoned off when events took place in the pavilions. Others objecting to the plans have included Neil Constable, the chief executive of Shakespeare's Globe Theatre nearby. He said the idea was "quite exciting" in principle but was concerned about "noise pollution". "We've been told up to 15,000 people will be assembling on these piers, and we do over 250 performances in our open-air theatre. "The noise will travel across the water and ruin the enjoyment of those." Local archaeologist Dr Fiona Haughey has also raised objections. She feared the park would accelerate the erosion of the river's southern bank. City of London planners are due to discuss the park next month.